The best of times, the worst of times. 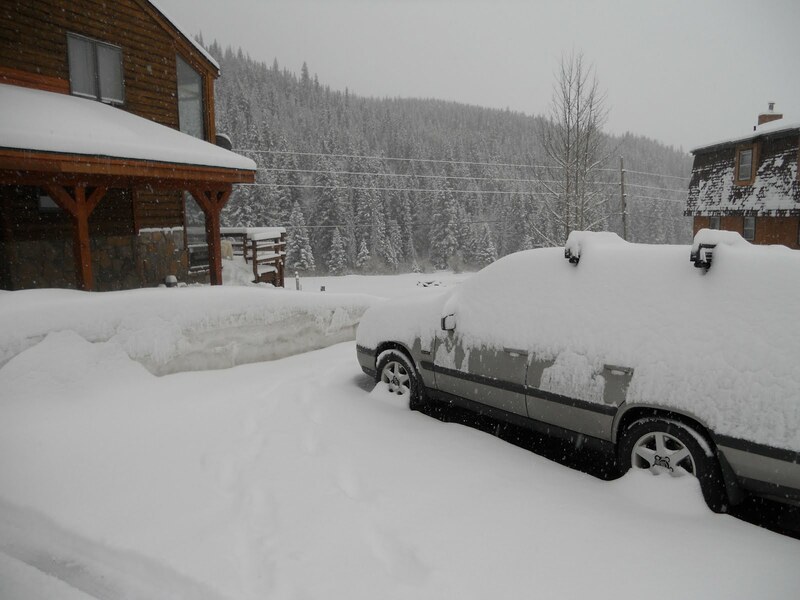 We awoke to 8 or 9 inches of snow in the valley today, and mo0re than a foot on the mountain. Fortunately, the race committee abandoned the effort at 8:30AM and the races were cancelled. Although I admire the drive and hard work race committees and staff invest in "saving" events, sometimes its just futile. On those days its very frustrating to be slipping perfectly good powder down a race slope all day while listening to the customers hoot and howl in the trees. So this morning was spent skiing some pretty nice powder. The Utah kids told Scott they wouldn't even bother going to the mountain for powder this heavy, but for us Northwest guys this was champagne! 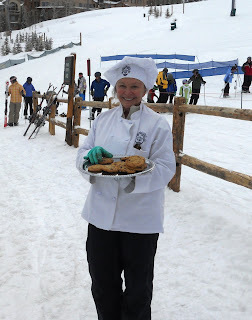 Another day at Beaver Creek, another freshly baked cookie. This is the playground for the rich and pampered. 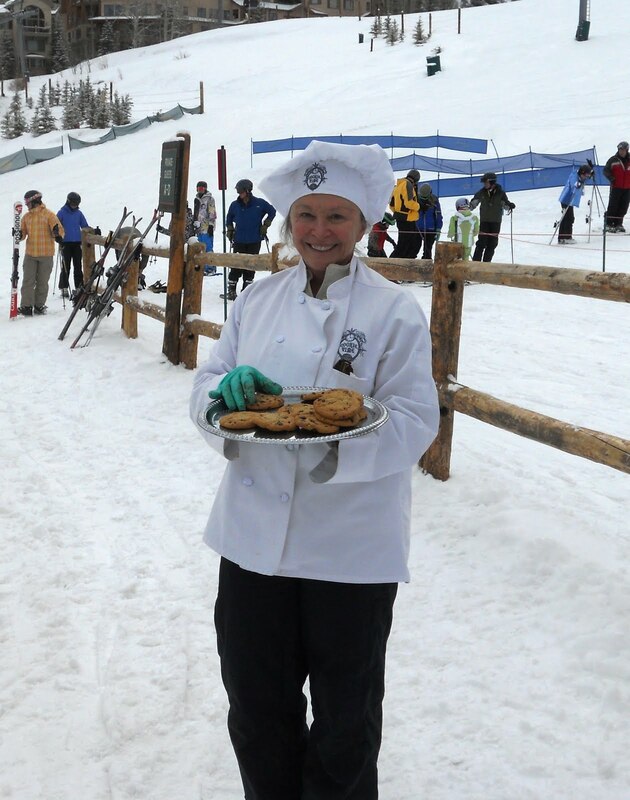 In addition to having great race venues, it features fresh chocolate chip cookies served in the lift line, hot chocolate (with whipped cream) served in little cups at the top of the lift, and even escalators. I remember the first time we came here in 1998 for NASTAR Nationals. Scott and Bonnie, who were then 7 and 10, lived up to the North Idaho reputation by riding the escalators repeatedly. The only caveate placed on them was not to grab a cookie each cycle. As I think about it, I need to talk to Schweitzer's GM, Tom Chasse, about installing an escalator from parking and serving warm cookies... I wonder how that would fly? Scott skied well today. No score, but two more solid runs, each better than the one before. He did well bringing the pressure to the top of the turn, but his line was a bit too round. That comes with timing, and he just hasn't had the slalom practice recently to refine it. I think his confidence is good right now though and he'll do fine in the slalom part of the Combined. Tomorrow he races Super G at Breckenridge where they got 6" of snow today and are predicting more tomorrow. I'm hoping the forecast is wrong. Regardless, Scott starts 19th so the course should still be fine. For those of you following this blog, you might have thought today was a race day. It was, sort of... Scott was only permitted to free ski this week, instead of the program proposed by the docs at Park City. Therefore, he never got into the slalom gates with the other guys. Yesterday he worked pretty hard at slalom skiing and ran "virtual" courses in his mind's eye. As a consequence, his race today was the first time through slalom gates since March 6th. He was a little rusty. He had a better start number than normal, 44, and the snow was decent. The field was a strong one with USST A,B, C and D team members present, plus a host of NCAA Div I guys. Scott skied two solid runs. His timing was a little off and he was pressuring below the gate on the pitch, but it was OK for his first time in Slalom gates for 20 days. He also took advantage of the warm-up gates all day, so this was a good training event. He has another Slalom here at Beaver Creek tomorrow, then it's off to Breckenridge for Super G and Combined. The weather has been cooperating so it looks like a few good races ahead. For my part, it was a great day. 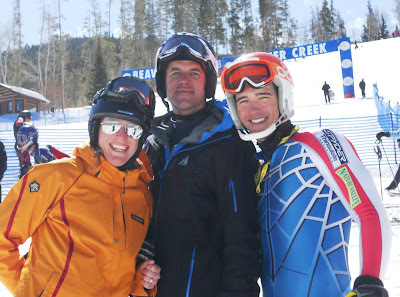 I skied with our great friends, Kent and Heather, who instruct here at Beaver Creek. The inside scoop was that Birds of Prey was groomed last night. Kent and I caught an early chair and were the first ones there. It was covered with 4-6" of fresh snow -- sublime! We capped that off with another 25,000 feet of vertical over the day, in addition to watching Scott's races, eating lunch and having a beer. A great time was had by all! The decision to go to the Center of Excellence proved worthwhile. Scott took another IMPACT test this morning. Afterwards the three sports physios had him bike 30 minutes, do agility ladders and lift some weights. After reviewing his test and observing his workout they have cleared him to start skiing again. He will begin by free skiing tomorrow, which was to be a day off anyway. Wednesday he can run gates, but must do the courses in sections. Thursday he can train full length courses. The coaches and physios will monitor him through all of this. It sounds like a reasonable plan. After some consideration and discussions with the physio, Scott decided to depart early and head to Park City. The plan at Whistler would not have included any racing, just rest, light exercise, and "maybe" a little skiing the final day. Not to say there was anything wrong with the plan, but from Scott's perspective he was concerned it wasn't moving towards anything definitive. He's pretty worried about missing any more of the races remaining in the season. So instead we packed out early and drove to Park City, where we are tonight. The plan is for Scott to spin the bike a little, get a really good night's sleep, then retest tomorrow morning. We're keeping our fingers crossed. After sitting out one day, Scott retested and they decided to have him sit out another day. He passed all of the mental acuity portions of the IMPACT test again, but his reaction time remained slow relative to his baseline tests. Scott's very depressed and frustrated -- sitting around all day with no physical or mental activity is not his normal state. It's also disappointing to miss these important races. He's now very worried that he'll also miss the Super Combined and Super Gs. Tonight they're having Scott spin on a bike for 30 minutes, then retake the test to see how he reacts. It all sounds pretty open ended and we're inclined to cut our loses, save some money, and drive out of here tomorrow. His next race after this series is Mar 26th in Colorado. We'll see what the verdict is. It would be nice if he was cleared to race tomorrow. It started out well... 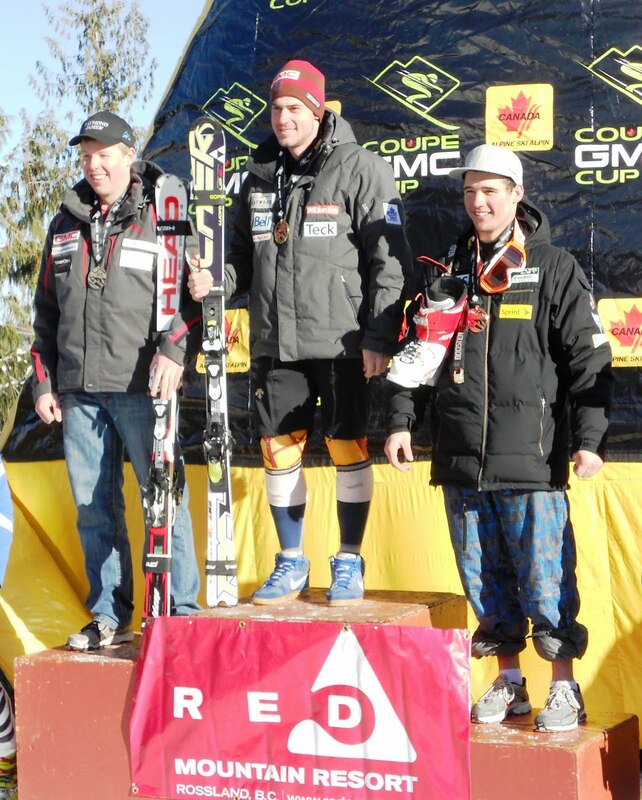 Yesterday Scott started teh Giant Slalom bib number 73 in soft conditions at the NORAM Cup Finals here in Whistler, BC. Although the likelihood of scoring in this situation was low, he went out with a smile to take it on. He had a very good first run, moving up to 24th and in position for a major result. He started 7th the second run and was skiing well when it all came undone. On the final pitch his outside ski got stuck in soft snow and he straddled the next gate at full velocity. The gate shattered and Scott spun, snapping backward to the ground. I was there were it happened and after he slid some 200+feet he sat for awhile before getting up. This was out of character since he normally leaps back to his feet so others won't worry. When he skied down to me I could see something was "off," although he tried to act normal. I decided to keep an eye on him all the way back to his hotel, then had him come spend the afternoon awake with us in a quiet room downstairs. That evening the Team doctor examined Scott and administered an IMPACT test (explained below). The outcome was that Scott's mental faculties were fine, but his reaction time was .007 seconds slower than his norm. After consultation between the doc, the trainer and Scott, it was decided he should sit out a day, especially since today was to be slalom. I was very pleased with how the Team handled this, and the decision. Scott's taking it seriously and understands the importance. The IMPACT test was adopted by the US Ski Team several years ago. In fact, it was one of the first major sports federations to fully commit to the program. Scott took his first IMPACT test three years ago when he went to the Trofeo Topolino with the Team. Since that time nearly every college athletic program, and many school districts, have also signed up. 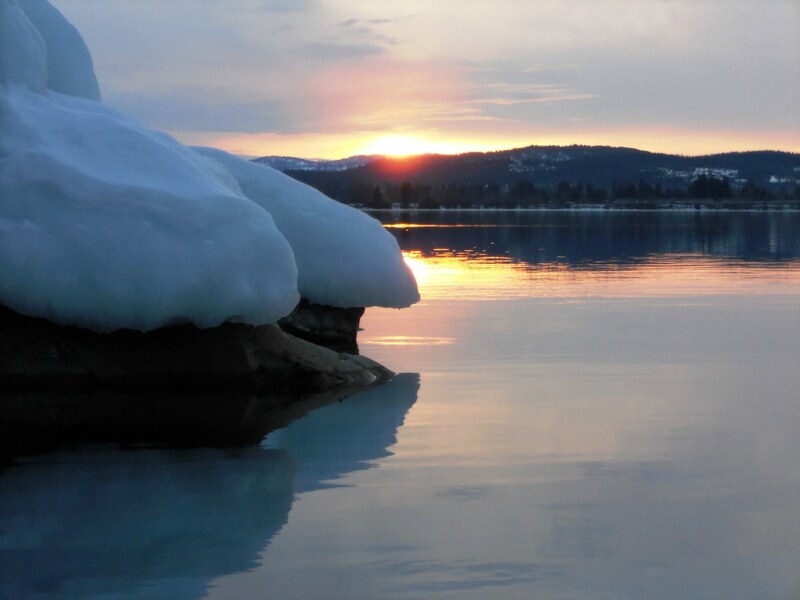 Last year our division, the Pacific Northwest Ski Association, bought into the program for all of its athletes. -- Athletes 11 and older take the test and form a baseline. -- Athletes age 11-19 should retest at least every two years due to how rapidly the brain changes during this period. -- If an injury occurs, the athlete takes another IMPACT test and the results are compared to the baseline. Doctors are able to determine the extent of the injury, what parts of the brain are injured and estimate approximate recovery times. Of course, recovery times differ greatly between individuals, so subsequent tests are administered to monitor progress. Scott's "chillin" right now and looking forward to tomorrow's slalom races. Guess I'm "chillin" too. I just received an e-mail from USSA the topic of which was "Time to Update Goals." A timely reminder for an important element of athletic success. Oh, the picture... This symbolizes that I'm home for a week with time to reflect on things such as goals. Lou Holtz says, "You must have dreams and goals if you are ever going to achieve anything in this world." And Michael Jordan, a man of significant athletic achievement, says, "I'm a firm believer in goal setting. Step by step. I can't see any other way of accomplishing anything." The US Ski and Snowboard Association invests considerable time and energy in educating coaches through clinics and literature about the goals process and how to integrate it into everything we do. I'm a strong advocate, having used the process while a military leader as well. There are two cartegories of goals, Outcome and Performance. When the layman considers the subject, Outcome goals come to mind, for example: I want to be a big league ball player; or, I want to win an Olympic Gold medal. Outcome goals serve a purpose and give general direction, but the meat and potatoes of the process is in the Performance goals. These are the baby steps, the many small skills, that contribute to success and have to be mastered to achieve the lofty outcome goals. I've used goals on our ski team since it's beginning. We start the process with the J6s, although the goals may be as simple as, finish in the top ten at half of my races; or, be able to ski every slope on Schweitzer in powder. However, by the time an athlete is Scott's age, the goals may be 2-3 typed pages long. A funny story. Although Scott and I had played catch daily in the summers, and he went to a 3 day baseball camp here in town every June, he'd never played organized baseball. At age 11 I told him he had to give me one season, just so he wouldn't embarrasse himself at the company picnic as an adult. He had a great coach and the first day he came home exclaiming that he loved baseball. He sat at the kitchen table and said, "I need to set some goals." His outcome goals were to bat 4th, play shortstop and make all stars. He then broke down the performance goals that would lead him there. We practiced hard every day that summer and he achieved all of his goals. 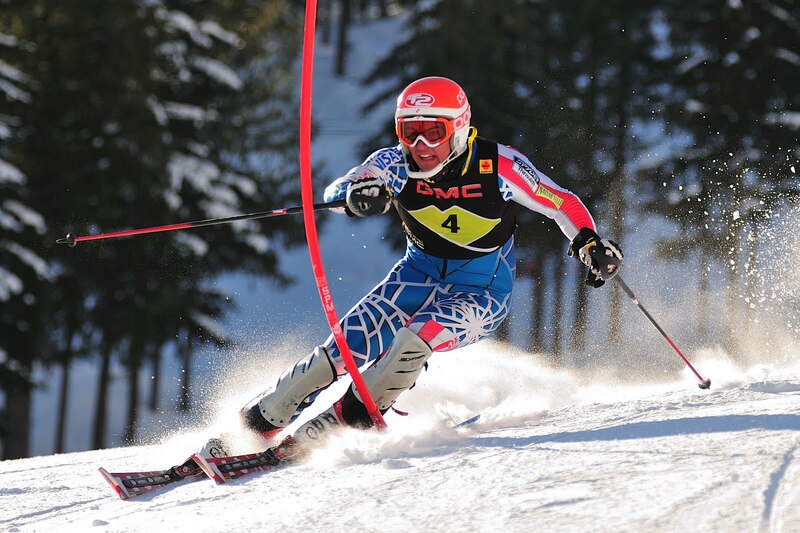 He applied the skills he'd learned as a ski racer to achieve in another completely different sport. I can not overstate the importance of goals. I couldn't do my job as a coach without goal setting. How could I coach with no idea what my athlete was trying to accomplish? Goals give me a chance to understand my athlete, see the world through his or her eyes. They also give me a chance to render a reality check and ensure goals are practical. Perhaps at age 11 the Outcome goal should be to nail down a starting position on the home team and be selected for all stars. Let's save the big leagues for later. Goals should be clear, measurable, challenging and attainable. Goals that are off-the-charts difficult are counter productive and discourage, rather than focus and encourage, the athlete. Once a good set of Outcome goals is agreed upon, we get to the heart of the issue. For each Outcome goal we identify the key ingrediants and break them into definable parts. We jointly assess where the athlete stands on these and what improvement is needed. Then we write each of these as a separate Performance goal. I like to categorize goals as Technical/Tactical, Mental, Physical and Equipment. 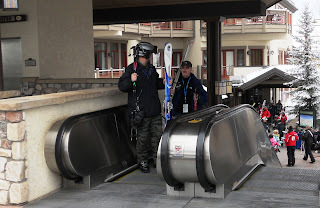 The Technical/Tactical category is further divided into Downhill, Super G, Giant Slalom and Slalom. I like to formally review goals three times per season, as follows: After Christmas break, which is the end of the intensive fall training and initial competition period. Early March, which is between the heart of the season and what I call the "Championship grind" of 15-20 races. And at the end of the season so we don't forget what has been acheived and what's left on the plate for next year. We treat the goals as a living document. During the reviews we type comments in italics after each goal, noting progress or achievement. If the younger athletes achieve a goal there's normally a new one which can be added in it's place. I try to be careful not to start out with so many goals that they become oppressive. Goals form a contract between the athlete, coach and parents. They are the roadmap to success. They are also a buffer when one falls short. Scott will not achieve half of his outcome goals this season -- its been a hard year for a variety of reasons. But he can look at his goals sheet and see the many places he has succeeded. WIth that knowledge he can start forming next year's plan. We spent last week at Red Mountain, BC apart from the rest of the US Team. Scott had a break and he had not done any races other than those prescribed by his coaches. His understanding had been that he could only race those events scheduled by the USST. Over Christmas, after he noted his teamates racing in regular FIS races and scoring, Scott scoured the FIS schedule for good tech opportunities. It was already too late to schedule anything in January or early February. This series at Red Mountain was the only good fit. The race originally promised to have a good points profile. However two weeks before the event a number of top athletes pulled from the event due to a conflicting Canadian training camp. Fair, understandable, disappointing. So suddenly we were left with a seed including a few 20 point racers and Scott. If any athlete in the seed failed to finish (which some did each day), the points handicap grew exponentially. And so it was. Notwithstanding it was a very valuable weekend for Scott. He completed all eight runs, skied very well, and restored his confidence in his technical skiing. He experimented with softer boots in Giant Slalom (and liked it), and closely monitored his edge sharpness relative to effectiveness (an issue this year). It was nice not to have a start bib in the 70's or 80s. Scott skied right with the 20 point racers, lowered his FIS profile by a few points and had a great time with all of his Canadian friends. As a bonus, his good buddies from our sister team at Schweitzer were in the same hotel. Good times!